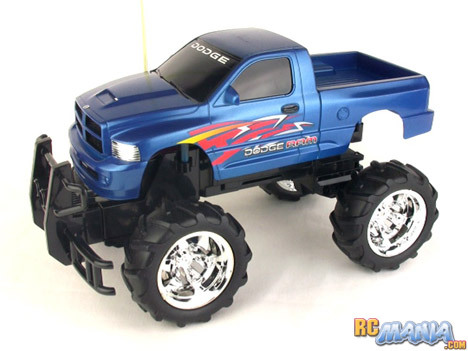 This Fast Lane Dodge Ram SRT-10, also available in Ford F-150 design, is your basic, inexpensive, high-riding RC truck for young kids. At a little over 13 inches in length, it's referred to as a 1/16th scale vehicle. It features an officially licensed and pretty well-detailed body and oversized mudding tires on shiny chrome wheels. The chassis underneath is extremely light in weight. There's no suspension and no digital proportional control, but the package does include all of the batteries needed to run the vehicle. Unfortunately they're not rechargables, just alkaline AA's. The truck is a little slow to accelerate, but has a respectable top speed for its size. It responds to steering inputs as quickly as you can ask for a toy-grade RC. When i took it to some mild off-road terrain, its acceleration slowed even further, but because the tires are large and made with a medium-hard rubber, rolling resistance is low, and the top speed didn't suffer much. Since there's no suspension of any kind, the truck does get jostled about when it goes over bumps, but it had enough power to handle terrain with rocks & dirt features about an inch. It would get stuck if I tried to go over anything around half the height of the tires, as the bumper and the axles stick down that far. It also didn't like to start on really rough terrain, especially if there's any incline. It's best to keep the speed up on this one, or stick to gravel and modest surfaces. The Fast Lane RC Dodge Ram SRT-10 is what I would call the very definition of "satisfactory" in both performance and value. It's not fast, but not particularly slow either. It comes with batteries, but they won't last long before they need to be discarded & replaced. I think it's fair to say you get just barely what you pay for with this one, and it should be considered only for younger kids who have just enough hand-eye coordination to operate it.